Taking Travel Pillow To A New Level | OhGizmo! Sleeping in the economy seat in most flights is not comfortable. If you’re lucky, you can twist and turn until you’re so tired, you fall asleep. But if you’re not, you’ll just have to freeze in one position till the plane lands. 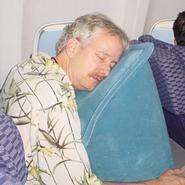 Maybe this travel pillow will help. Maybe not. The Skyrest is an inflatable pillow that lets you doze off leaning forward! ← Eat This, De Beers! That guy is going to wake up with one heck of a sore neck. I bought this pillow before flying from the US to Istanbul. I’m always uncomfortable sleeping upright and this worked really well. (It’s made for a taller person, so I just deflated it a little to get the right height.) I don’t know where it is right now, so I’m buying another one today for a trip to China this week.